National Coat of Arms of Armenia was adopted by the Supreme Council in 1992. It replaced the emblem of the Armenian SSR after the collapse of the USSR. 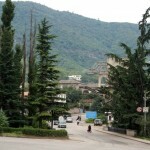 Its origins go back to the establishment of the Democratic Republic of Armenia (DRA) in 1918. In that year, an early variation of the coat of arms was adopted by the DRA. 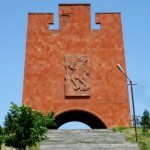 The coat of arms was designed by architect Alexander Tamanyan (best known for his work on Yerevan’s city plan) and artist Hakob Kojoyan. The coat of arms combines new and old symbols. Coat of Arms consists of the following elements: an eagle and a lion supporting a shield. 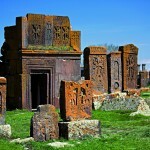 The eagle and lion are ancient Armenian symbols dating from the first Armenian kingdoms that existed prior to Christ. The shield itself consists of many components. In the center is a depiction of Mount Ararat with Noah’s Ark sitting atop it, since according to the biblical legend, the ark have finally rested on the mountain after the great flood. The shield is divided into 4 sections, which symbolize the four independent Armenian Kingdoms in the history of Armenia. In the lower left portion of the shield, there are two eagles looking at each other, symbolizing the length of the Armenian territory during the reign of the Artashesyan Dynasty that ruled in the 1st century BC. In the upper left portion, there is a lion with a cross, the emblem for the Bagratuni dynasty that ruled during the Middle Ages. 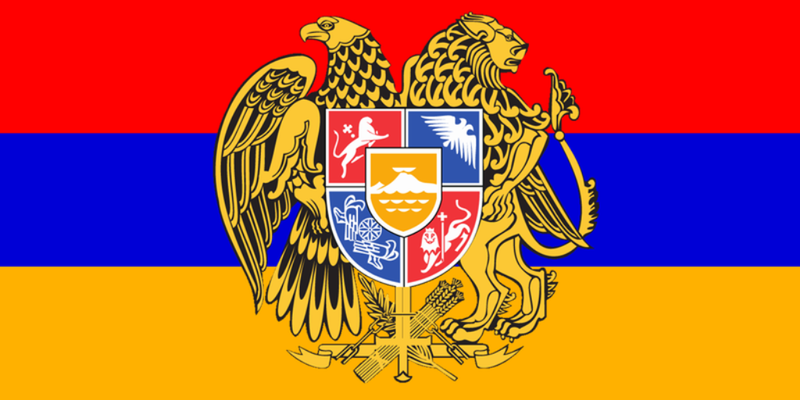 In the upper right portion, there is a two-headed eagle, the emblem of the first dynasty to reign over a Christian Armenia, the Arshakuni Dynasty of Armenia. In the lower right portion, there is a lion with a cross, the emblem of the Rubinyants dynasty, which reigned in Armenian Kingdom of Cilicia, a state that expanded and prospered during the 12th and 13th centuries. The lion and the eagle supporting on the right and left sides of the shield are the kings of the fauna and symbolize power, courage, patience, wisdom, and nobility in animal kingdom.